Supermarket chain Asda is to stop selling monkfish amid concerns over depleting stocks and the way it was being fished. The retail giant says it will no longer supply the restaurant favourite until there are more sustainable ways of catching it. 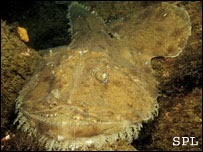 Asda said the technique used to harvest the deep-sea monkfish was damaging to the marine ecosystem. It urged celebrity chefs to stop serving or endorsing the fish. Monkfish are often caught through beam trawling - where a fishing boat drags a net attached to a beam along the seabed. The method has been accused of destroying underwater habitats. This slow reproduction pattern of monkfish also meant it was at more risk than other species, said Chris Brown, Asda's sustainable and ethical sourcing manager. He said: "More needs to be done to protect it. "We've decided to ban monkfish sales as a precaution until the industry takes appropriate action to ensure its long term survival." Asda was unable to confirm how much monkfish it sold though said it was considerably less than the most popular choices of cod, haddock and salmon. Mr Brown said he hoped celebrity chefs would stop endorsing and serving the product until the longer term viability of the species was clear. He said: "Top chefs can drive the sale of ingredients sky-high overnight simply by using it in their TV programmes or mentioning them in interviews. "We would like to see them use this power to encourage people not to buy monkfish, or any other vulnerable species, so that we can protect stocks for generations to come." Greenpeace spokesman Oliver Knowles welcomed the move: "With significant amounts of monkfish coming from the beam trawl fishery, the decision to stop selling this species is a significant step away from this type of destructive fishing."